The probe the researchers are building is a transistor with an active channel measuring just a few billionths of meter across. It uses a pair of electrodes made of ferromagnetic metal, between which a single electron will be trapped. The researchers hope that when the electron “tunnels” (winks out of existence in one place and appears in another), they can establish a quantum critical state in the electrodes where the particle is trapped. Researcher Douglas Natelson explained how they would use the gate voltage in the probe to tune the physical state. “We should be able to move the system from a quantum critical state and back again, simply by turning the knob on the voltage. That’s a level of precision that’s never been possible in another experimental system.” The probe’s design will allow the physicists to confine an electron with its spin on one molecule inside the transistor. In one quantum state, the tunneling effect causes the constrained electron spin to become “entangled” with the spins of electrons in the nearby metal electrodes. The magnetic nature of the electrodes also dictates the existence of a collective oscillation among the spins of electrons in the electrodes. These oscillations – known as “spin waves” – will interact with the magnetic moment of the constrained electron’s spin and try to break the entanglement. 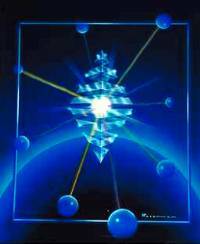 The quantum critical point occurs when it is broken and the material transitions from one quantum phase to the next. The new probe should permit the physicists to introduce competition between two quantum effects – magnetic quantum entanglement and coupling with spin waves. By accessing the quantum critical point that lies at the phase change associated with these competing forces, the researchers can draw a direct linkage between the quantum criticality in the new probe and quantum criticalities in bulk materials like heavy fermion metals. This could provide direct experimental evidence for the theorized destruction of the magnetic quantum entanglement that appears at the quantum critical point of heavy fermion metals. The researchers are excited about uncovering much-anticipated evidence about the precise way that quantum criticalities form in nature. “With this unique experimental data, we hope to gain an in-depth understanding of the phenomena that may well be what engineers need in order to harness the power for high-temperature superconductivity,” said Si.